Got Aluminum Foil? Your Problems are Solved! Sometimes the lowliest products around the house are the most useful, especially when you’re in need of something and need to invent a solution. Just look at all these great ideas for aluminum foil. Keep a roll handy! Need a funnel or pastry bag? Shape foil into a cone. Need a wine or bottle stopper? Look no further than a rolled up ball of foil, shaped to a perfect fit. Wrap warm baked goods in a napkin and place a layer of aluminum foil underneath. The foil reflects the heat and keep your bread warm. Line a pan with a sheet of aluminum foil, fill it with cold water, and add two teaspoons of salt. Drop your tarnished silverware into the solution, let it sit for two to three minutes, then rinse off and dry. Store freshly cleaned silverware on top of a sheet of aluminum foil to deter tarnishing. Crumple up a handful of aluminum foil and use it to scrub your pots. Disguise small flaws on a mirror’s reflective surface by putting a piece of aluminum foil, shiny side facing out, on the back of the glass. Sharpen scissors by cutting several times into several layers of foil. To slide big pieces of furniture over a smooth floor, place small pieces of aluminum foil under the legs. Wrap the arms of your glasses in foil to protect them when you colour your hair. To get rid of starch stuck on your iron, run your hot iron over a piece of aluminum foil. Mix strips of aluminum foil in with your garden to keep hungry insects and slugs away from vegetables. Wrap the tree trunks with a double layer of heavy-duty aluminum foil in late fall. Put a piece of aluminum foil under your ironing board cover. The foil will reflect the heat back through the clothing, smoothing wrinkles quicker. Keep messy drips off the bottom of the oven by laying a sheet or two of aluminum foil over the rack below. Make a disposable drip pan for your BBQ out of a couple of layers of heavy-duty aluminum foil. The next time you use your barbecue, crumple up the foil and use it to easily scrub off the burned food before you start cooking. Brighten up the electrical lighting in your backyard or campsite by making a foil reflector to put behind the light. 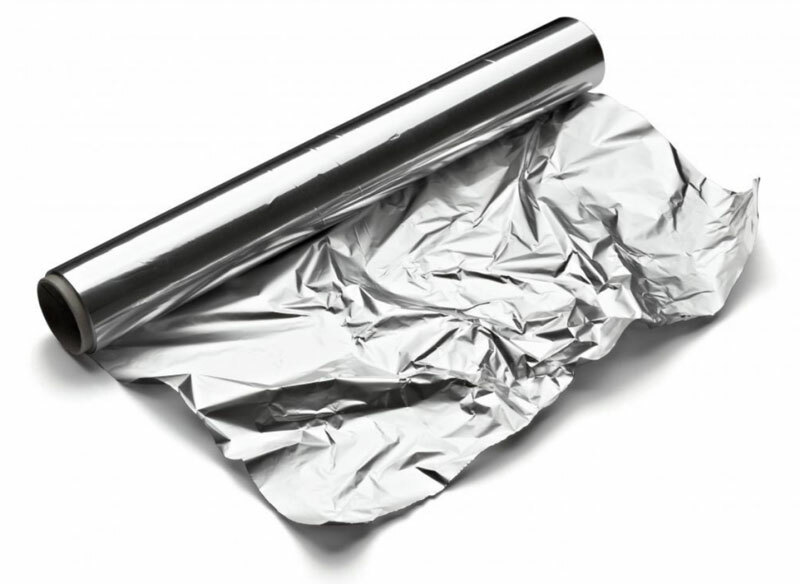 Place a piece of heavy-duty aluminum foil under your sleeping bag to insulate against moisture. Wrap your kitchen matches in aluminum foil to keep them from getting damp on camping trips. Wrap some aluminum foil around a fishhook to make a lure. Fringe the foil so that it covers the hook and wiggles invitingly when you reel in the line. When you’re painting a door, aluminum foil is great for wrapping doorknobs to keep paint off them. For sparkling chrome on your appliances, strollers, golf club shafts, crumple up a handful of aluminum foil with the shiny side out and apply some elbow grease. If you rub real hard, the foil will even remove rust spots.